A little later than anticipated, but here is the extended post about last weeks meeting (July 2nd, 2015) we had with the deputy chief public attorney George Rasker, public attorney Olav Beckers, and forensic investigation coordinator Jos Camps/Kemp (I’m uncertain about his name as his thick Limburg accent made him difficult to understand) from the Public Attorney’s Office in Maastricht (Openbaar Ministerie). They were going to give a presentation about their findings of the blood spatter that was left in the house where Eline and Mart lived and where Eline most likely sustained her fatal stab wounds. By investigation the blood spatters from December 8th, 2009, the Public Attorney’s Office directly admit that they did not do a proper investigation at the time, as we have been told by the very same Public Attorney’s Office on several occasions. The problem now is that the samples have been in storage for over five years. Add to the workload from the MH17 crash over Eastern Ukraine and a significant capacity bottleneck at the Dutch Forensic Institute (NFI) is revealed. One direct consequence for us has been the delay in hearing what the results of the investigation of the blood spatters is. On January 12th, 2015 we were promised that the investigation would take about 6 to 8 weeks. It lasted until July 2nd before we learned what the results were. A little longer than 8 weeks, I would say. What bothers me is that it was up to us to remain up to date about the progress of the investigation, as the Public Attorney’s Office did not try to contact us at any point to fill us in about any delay or status of progress. All in all, the meeting of July 2nd went as we expected our earlier meeting of August 19th last year: we would be told that their review of the case confirms suicide. Although a few things were added to the dossier, the conclusion of suicide remains the same, as does the logic used back in 2009. I will not go into any details about what was said and what we learned, and what was not said, and what was not investigated, as this might be important at a later stage in our pursuit to have a proper investigation conducted to determine how and why Eline died. What did surprise me was their use of their investigative language. We were told that they tested the new DNA and blood evidence in a hypothesis-driven manner. Yet, they remained vague what their null hypothesis was and what the actual testable hypotheses were. To me their argument read as if their null hypothesis was: Eline committed suicide. This would be of great interest as very few people commit suicide in the manner Eline has been accused of committing suicide. A point I have elaborated on, based on published academic work, earlier. First of all, a hypothesis always has to be testable. Merely stating that you tested if certain evidence fits a homicide scenario is not per se testing a hypothesis. By itself it is too vague. A question as: this blood spatter in this room is caused by the victim as it defended itself from the assailant with a knife. The null hypothesis is thus that the blood spatter is not caused by a victim fending off an assailant. In this case the testable hypothesis has two components: 1) the blood spatter contains the DNA profile of the victim and 2) the blood spatter might contain a mixture of low and medium speed blood spatters patterns, as might be expected when a victim’s hand/finger slides along the knife to keep the knife at bay. Furthermore, in the case of one specific piece of photographic evidence the Dutch Forensic Institute gave two interpretations they thought was plausible. Yet, we were told that these two possible and potentially plausible interpretations were conclusions. A remarkable use of words and one I cannot agree with. To me this indicates that there is fundamental lack of understanding what a interpretation of something is and what a conclusion is. Also, the interpretation of other evidence was remarkable as conclusive interpretations were given in the absence of verification. In other words, assumptions were made on unverified evidence and used to support their scenario. Sadly I cannot be more precise about any of the details to make it more clear what I am talking about. Finally, the public attorney also seem to hold the opinion of a so-called expert in extremely high regard. Any claim or argument, even if they were clearly made up ad hoc, was assumed to be true, because an expert said so. This lack of critical examination of evidence and expert witness is extremely dangerous and can very easily facilitate confirmation bias. Altogether, the story we were told by the public attorney’s office was by no means convincing and rang like a deja-vu from a phone-call on the evening of December 9th, 2009. Joëlle De Pruyssenaere de la Woestijne – Yes, but what many people do not know is that I entered the house she was upstairs in the bathroom. And he had called the doctor for help in the morning. Two people in specific gave some very interesting responses. 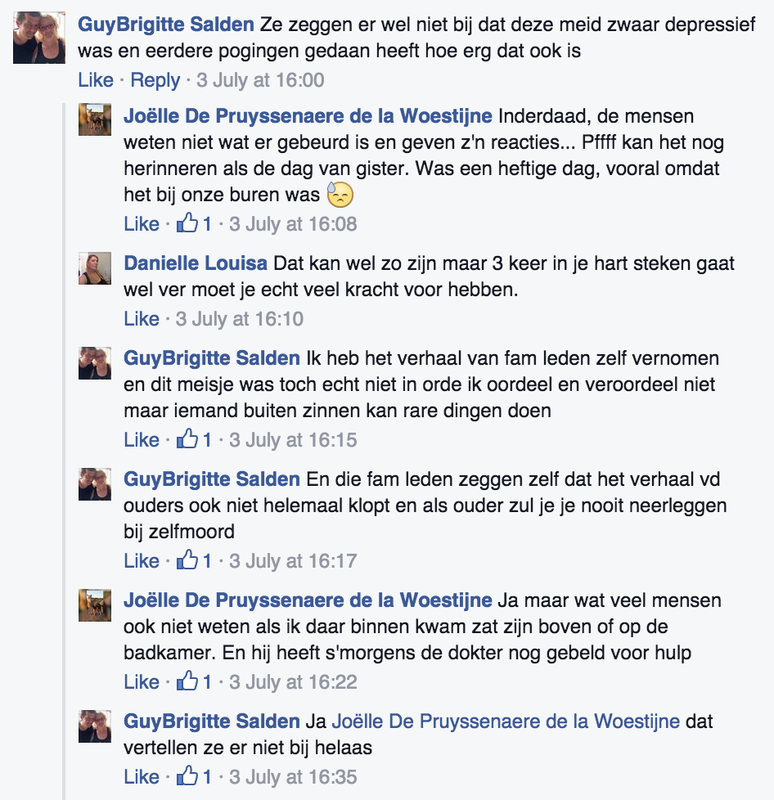 According to GuyBrigitte Salden was Eline not only suffering from major depression, she had also made several attempt on her own life before. This Facebook user claims that the source of this information is Mart’s family. This certainly reads as if his family is trying to put defamatory comments out there to portray Eline as a highly unstable person. As I have yet to read a single psychiatric or psychological report on Eline’s mental state, I cannot attest to the truthfulness of the claims supposedly made by Mart’s family. For all clarity, the general practitioner (GP or huisarts) of Eline and Mart was unable to make a clinical diagnosis at the time of Eline’s death. More interestingly with regards to evidence and claims made by the public attorney’s office is the comment from Joëlle De Pruyssenaere de la Woestijne. This Facebook user said that she was Eline’s and Mart’s neighbor and had been inside the house after Mart had called their GP. Several very obvious question arise from this statement and I am very interested to learn more about this. All in all, we are back to square one with a few new details and maybe finally access to the dossier, access we have been denied up to now. This also highlights, once again, that victims and families of victims in the Netherlands desperately need official legal standing during a criminal case. The legal standing should not be limited to criminal cases as defined by the public attorney’s office, but by the mere fact that the police was at any point involved in determining and/or investigating the death of a person: thus all unnatural deaths or suspected unnatural deaths. Only when police investigations can be examined in retrospect is it possible to learn from mistakes made in the past. In the current situation, the people stand by the mercy of the openness of the police and the public attorney’s office. And they do not have a very good track-record in being an open organization.